Communication, above all else, is about connecting with someone to bring them into an understanding of your beliefs, to inform, influence and entertain. Whilst there are many ways to achieve this, they are only at their most effective when presented with clarity. Whether face-to-face, broadcast through a loudspeaker, or displayed on a screen, the message must be clear, intelligible and easy on the eyes and ears! Since 2003 we have been carrying our installations across the UK and have worked in some of the countries most prestigeous buildings. As well as carrying out our own installations we are often called on by other installation companies to provide them with technical support and specialist installation and engineering support. Our engineers have previously worked for some of the leading companies in the AV industry, including TOA and Bose. We carry out installation and service work on many different types of systems in many different types on venues. 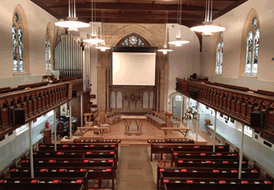 Churches require a whole range of products from sound systems for speech only or full music group through to video projection and effects lighting systems. Induction loops are a typical requirement and can interface with an existing sound system or be a stand-alone unit. Reception desk induction loop systems have become the most common method of making provision for communication with hearing aid users. 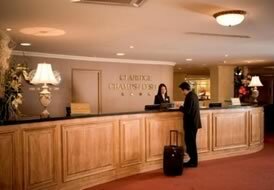 Businesses, hotels, retailers and medical practices are all typical users of reception counter induction loops. 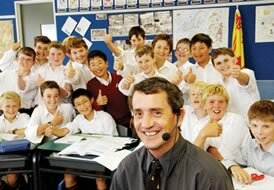 Schools utilise a wide range of audio-visual systems. Classrooms are fitted with soundfield systems to distribute sound throughout the teaching area and induction loop systsems aid communication with hearing aid users. Halls and drama studios use full sound and lighting systems for larger events.